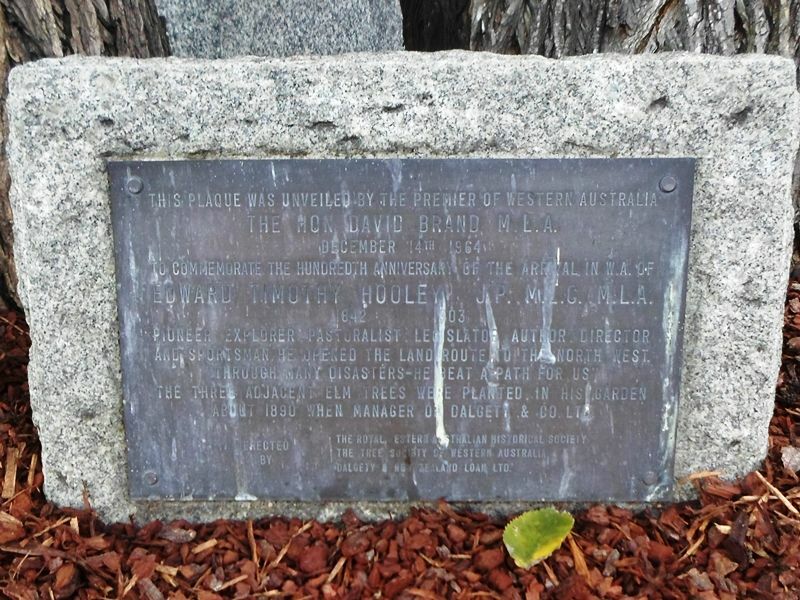 A plaque commemorates Edward Timothy Hooley`s contribution to the European settlement of Western Australia. Edward Timothy Hooley (1842 – 3 August 1903), usually known as E. T. Hooley was an explorer in Western Australia, who in 1866 pioneered an overland stock route from Geraldton to the Ashburton River. He entered politics in later life, serving nearly three years as a Member of the Western Australian Legislative Council, then nearly six years in the Western Australian Legislative Assembly. Possibly the first major service infrastructure in the Pilbara were the wells built by E.T. Hooley as he pioneered the De Grey - Mullewa stock route in 1866. Leaving the Geraldine mine in May 1866, he followed F. T. Gregory`s track of 1858 with seven men, including two Aboriginal prisoners and two teams of horses, and for the first week, Dr Bompas, who accompanied them as naturalist. The party proceeded along the Murchison to the Gascoyne, then struck north past the Lyons and Henry Rivers. Hooley named Gregory`s Spring and Mount Roe and arrived at Nickol Bay after a journey of three months and a loss of only eight sheep. Appreciative settlers presented him with a fine gold watch. Interested in new developments, Hooley was attracted to the pearling industry. In April 1868 in his schooner Liberty,which intended to use the schooner for coastal trading and pearl fishing but was faced with labour problems, drought, low wool prices and hostile Aboriginals on his isolated property. He soon accepted an offer to manage a stock company at Guildford and then, with William New as partner, established a sheep station at Williams, south of Perth. Although it was reasonably successful Hooley yearned for the north and in 1882 overlanded to the Ashburton. On the way he lost almost half of his 6500 sheep and cattle but settled at Mount Hubert and took up an additional 161,876 hectares at Mount Mortimer and a cattle run near the Henry River. He was a member of a government party from Roebourne, led by Alex McRay, which was invloved in a serious confrontation with local Aborigines at Mount Stuart Station in which there were many casualities, with this event being called the "Battle of Minderoo." Later in Perth, Hooley became manager of John Monger`s mercantile company; and when it was absorbed by Dalgety`s he became joint manager and later managing director until ill health forced his retirement in 1900. Appointed to the Legislative Council in December 1891, he ceased to be a member when it became wholly representative, but represented Murchison in 1894-97 and De Grey in 1897-1900 in the Legislative Assembly. 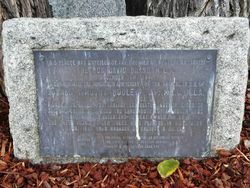 This plaque was unveiled by the Premier of Western Australia the Hon. David Brand, M.L.A. To commemorate the hundredth anniversary of the arrival in W.A. of Edward Timothy Hooley J.P., M.L.C., M.L.A. Pioneer, explorer, pastoralist, legislator, author, director and sportsman. He opened the land route to the north west. 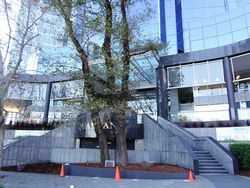 "Through many disasters - he beat a path for us"
The three adjacent Elm trees were planted in his garden about 1890 when Manager of Dalgety & Co. Ltd.
Dalgety & New Zealand Loan Ltd.